Ring in the new year early! Ring it in at the same time as the east coast. Go somewhere cooler at midnight or just beat the drunks home! 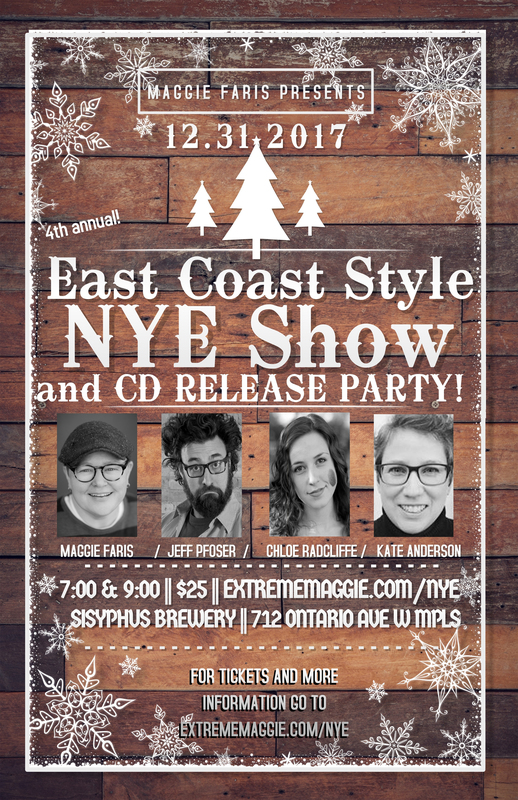 This comedy show is hosted by Maggie Faris, and features twin-cities fast-rising stars Jeff Pfoser, Chloe Radcliffe, and Kate Anderson. As in years past there will be BOOBY PRIZES!!! This event will also serve as Maggie Faris’s CD Release Party. Maggie will be debuting her 2nd album A Dungus Amung Us. Her upcoming sophomore album, A Dingus Among Us, was recorded at 2nd Story Comedy in St. Peter, MN, a club run by Michael Callahan. The album is a collection of Maggie’s new and old favorites, coupled with the signature brand of silliness that she has become known by and helped her to achieve so many accolades.